I've been in and out of town over the last month, which included some excellent fabric shopping at Portland and Santa Monica quilt shops! I've managed to squeeze in some sewing time between my recent travels. Here's some of what I'm working on this week. Both of my kids are working on quilt projects during their summer vacation. 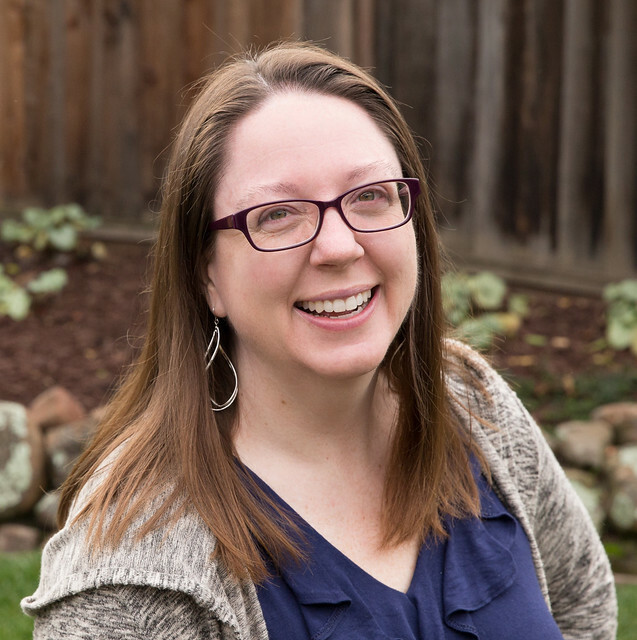 I shared a peek on my Q3 Finish Along list. More recently, my daughter has begun quilting her project. She's using a walking foot and decided on rainbow-like arches of quilting with rainbow variegated thread, inspired by Allison's HST quilt. She's "driving" while I assist, reminding her when to stop and reposition her hands, and holding the weight of the quilt for her while I advise on the general path she should be taking. This part is slow going. It's not the best ergonomics for me, leaning over her as she sews, so we only do one pass at a time. Here's the beginning of her quilting. And my son has one row and one column left to piece on the twin-sized bed quilt he's making for his sister. She's been hogging the sewing machine (and I'd need to switch the foot and thread), so he's kind of on hold. 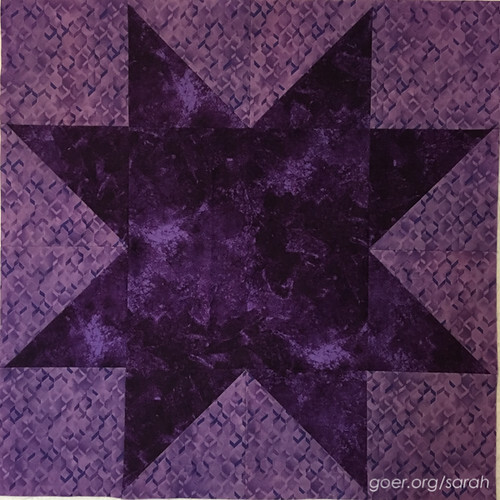 I'm participating in the Star Light Star Dark Quilt Along with Jessica from Quilty Habit. This week we got our first piecing instructions which were to make these 18" star blocks. I'm loving how this project is going so far. We had the option of a 4-block or 6-block version for the quilt along and I decided to go with four. Purple is obviously my first color and I'm using yellow and orange as my second color. The left blocks of the quilt will feature the lights and the right blocks will feature the darks. I'm choosing to set mine with same colors in diagonal placement, as shown below. Our next step is to piece the small stars next week. See others' progress on Instagram. I finally dove in and made some fabric selections for my new La Passacaglia project. I have loved so many of these quilts that I've seen in progress and finished by others on Instagram. I don't have an overall plan for the colors and fabrics I'll use throughout the project, but I cut out the first 90 pieces for rosette #1. Hand piecing, here I come! I'm linking up to Let's Bee Social and Needle and Thread Thursday. 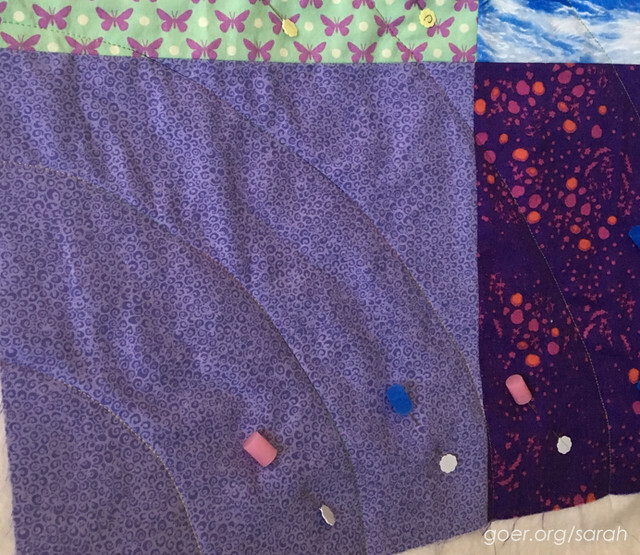 WIP Wednesday: Star Light Star Dark and Other Stuff WIP Wednesday: Finishes and Fabric Pulls WIP Wednesday: Preparing to Quilt WIP Wednesday: What’s in the Cards? 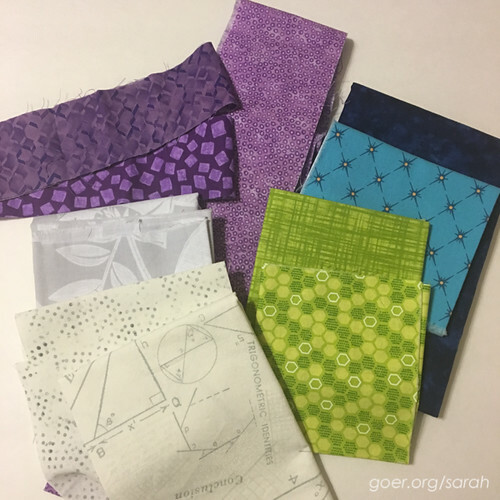 Posted in Quilting on August 3, 2016 by sarah. 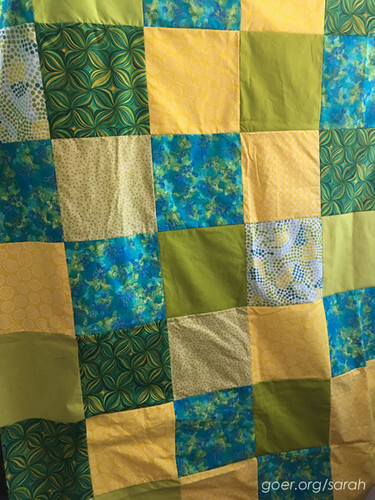 Always fun to see what you're up to regarding quilting...and so fun to watch the growth your son is displaying in his quilting. So happy that your daughter is liking it as well.!! Loving your stars in the quilt a long , and more importantly I love how your kids outfits blend with your blog header ! I hadn't even noticed that about their outfits! :-) Thanks for visiting, Helen! Thank you for the link Sarah. 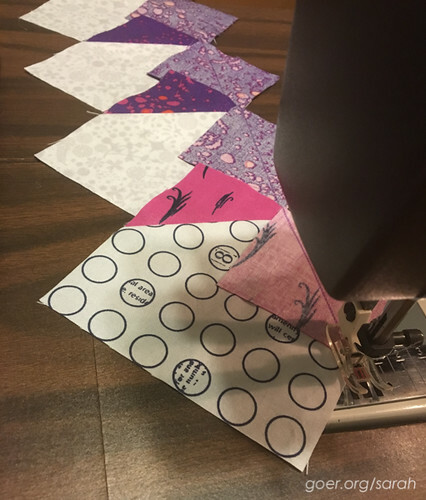 I'm so happy to be a little part of inspiring the next generation of quilters ☺ Those times spent hunched over the sewing machine with your children will become one of the special memories sewn into those lovely quilts. That's such a sweet sentiment. Thank you, Allison. Your daughter's sewing is so fun to watch! Yay for the walking foot! Every time I see your SLSD quilt I get giddy. Great job doing the prep for your handsewing. That must have been so time-consuming. 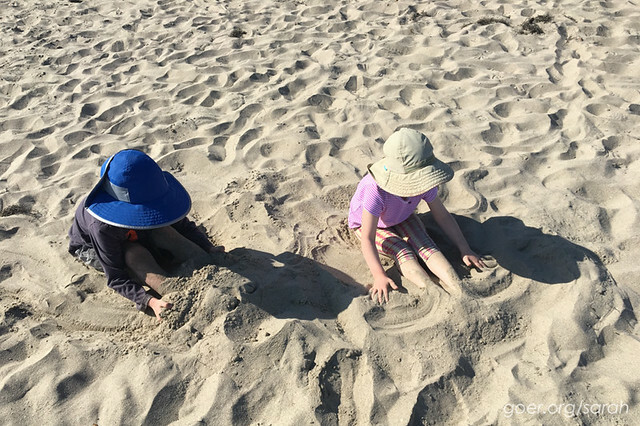 What fun summer projects for all!! Can't wait to see at a future show and tell!! Hopefully we can get some finishes ready in time for the next meeting. :-) Thanks for visiting! I love the update on the projects your kids are quilting. The ergonomics of helping your daughter do sound like frequent breaks would be important. Do they ask to work on the projects with you or is this something that is scheduled at all? 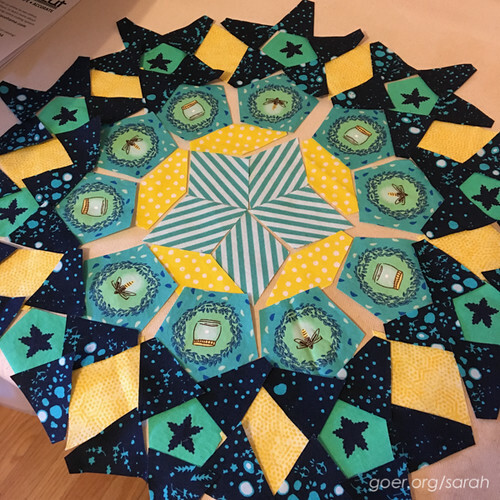 I'm loving seeing everyone's large stars come together for the Star Light Star Dark QAL. The orange and yellow are going to compliment the purple very well for you and I love the diagonal layout you are going to use. They ask to work not he project. Sometimes we make appointments to work if I'm not available when they want to sew. I agree that it is so fun to see everyone's project on SLSD. I can't wait to see more! :-) Thanks for visiting! 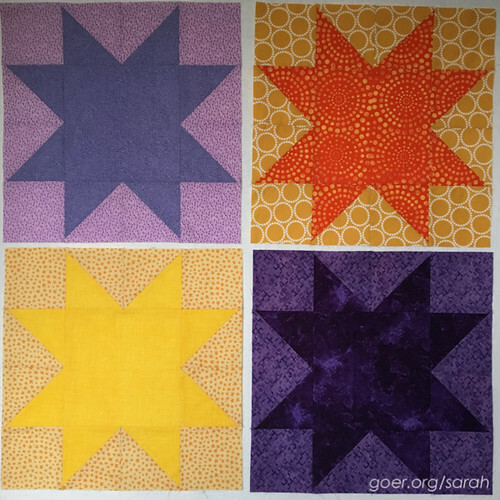 How I'd love to do the Starlight QAL but just too many other projects on the go. LOVE your fabrics for La Passacaglia! Fireflies?! I love seeing them here at night just magical. Wonderful that you're getting both your kids to quilt! Loving yours and everyone's SLSD big blocks, now I'm questioning my fabric choices. Sounds like your children are really enjoying their projects! And your EPP is beautiful! I just popped over to your IG and/or first SLSD block is AWESOME! I think your fabrics will look great in the finished project. Thanks for visiting, Paige. I love that your children are into quilting. Can't wait to see the finished projects. This is the first I've hard of La Passacaglia. Now that I've seen your project, I want to do one as well.